The KN high-efficiency commercial, gas-fired boilers feature a self-adaptive design tolerant to changing conditions. Their on-board heat-net integrated boiler management control system provides the ability to control up to 16 KN units in a boiler network for optimized heating efficiency, without the need for a traditional wall-mount control panel. This control system also allows communications with various building management systems, such as Lonworks, Modbus, and Bacnet. The boilers have Tru-Flow technology to control the air fuel mixture at all firing rates and multiple venting conditions. Combustion air is constantly tracked by the fuel gas flow through the gas valve to maintain combustion parameter consistency throughout the full modulation firing range. 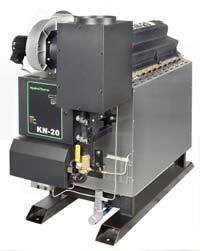 The KN line includes: the KN-6, a 600,000 Btu model; the KN-10, a one-million Btu boiler; and the KN-20, a two-million Btu unit. Each is equipped with a low-noise blower, unique air inlet, and low-velocity burner for quiet operation. The units have a footprint of less than 29-inches. Their design allows accessibility to all components. Their user-friendly controls provide multi-function monitoring in all operating modes with text display and intuitive diagnostics.